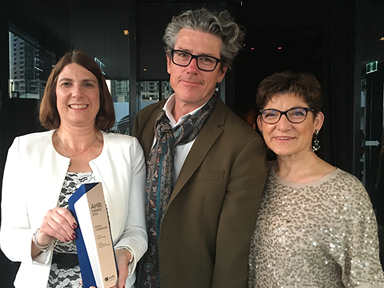 Monash College's ambitious Pop-up Learning Village project was recognised at the 2016 Australian HR Institute (AHRI) awards. The project was awarded highly commended in the innovation and creativity category. Monash College was up against top competition with Qantas taking out first place, and Bayer and the ATO amongst the finalists. Three years of unprecedented growth saw us exhausting our existing classroom capacity. This environment, combined with a strategic drive to better-prepare students for university, provided the perfect catalyst for change. Our Pop-up Learning Village project embraced the speed of prefabricated classroom deployment and inventive design to create inspiring teaching and learning spaces. Innovation didn’t stop at the new building. The project team used the challenging growth environment as an opportunity to align people, place and technology in order to embed Technology Enhanced Learning in our Diploma programs. The project incorporated a comprehensive change, employee engagement and eLearning strategies to drive student success. The team engaged our academic leaders to change pedagogy and build teacher capability through professional development, fostering a culture of innovation. From concept to ribbon-cutting, our Pop-up Learning Village was delivered in a remarkable 10 months. The project facilitated significant and sustainable shift to deliver teacher excellence at Monash College, which continues to be a focus. AHRI is the national association representing human resource and people management professionals. Their awards recognise and celebrate HR excellence. The AHRI Award for Innovation and Creativity profiles outstanding initiatives or programs which support a creative an innovative culture.